Here is the plan for the coloring book. Page one is just text, so that is omitted here. 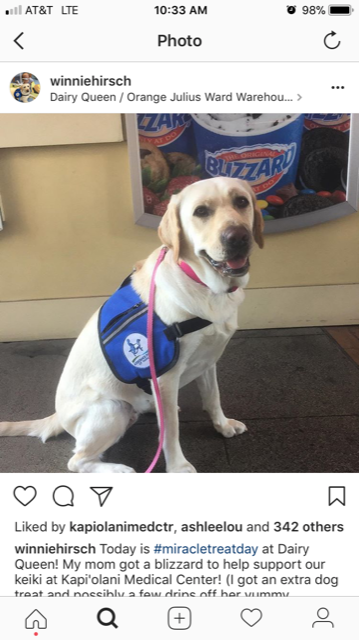 The captions are provided so you have an idea of where to leave space on the page for them. You don't need to type or write them out, just provide the line drawing described. On the right you will see reference photos and in some cases, a rough outline Jeff worked on while communicating with the staff. You can create your own vision, though, as long as it fulfills what the staff has asked for. 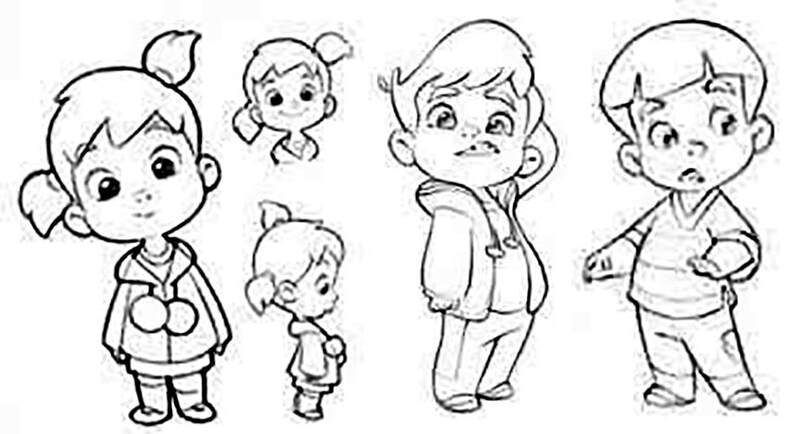 Jeff was nice enough to draw out the first versions of the kids. 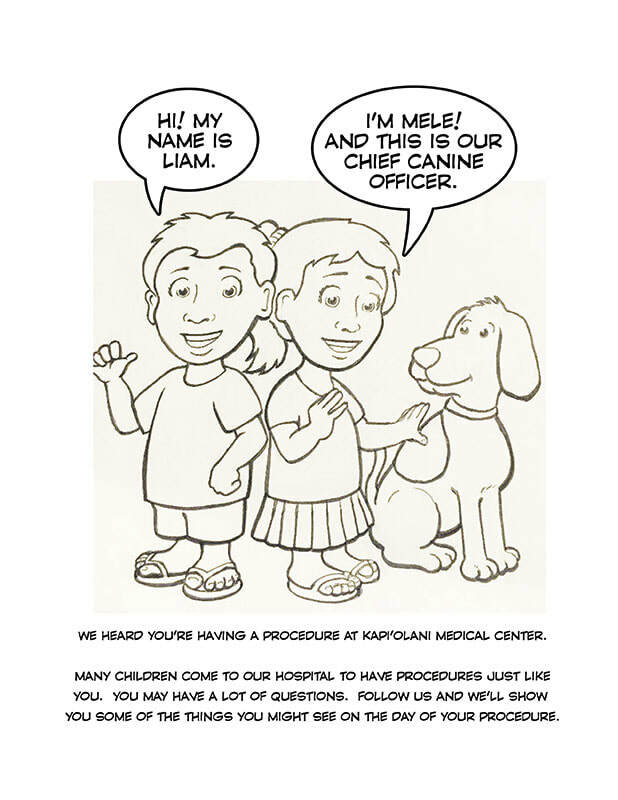 The hospital staff has requested big pupils, cartoon-like, with calm, happy facial expressions, and a ponytail for the girl. They sent the reference pictures on the right of the look they are going for. 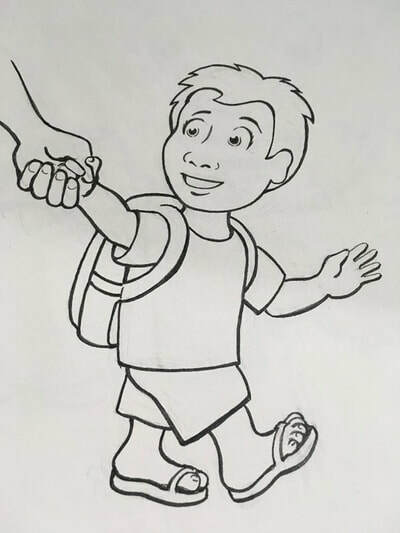 EDIT: The staff has requested that the girl be drawn in a dress or tunic with leggings instead of the shirt/skirt combo for her street clothes. Please note, on pages 7-12, the kids will be dressed in their hospital outfits instead of street clothes. Draw graphics to fit into an 8 x 10 space (consider the room you must leave for captions as well, so not all images will fill up the entire space) and send 300dpi tiff files to gennypen@gmail.com. Our tentative deadline is April 3, though that can be extended. ​Kapi'olani Medical Center in the background, their sign with the logo on it. Boy and girl characters in the foreground. 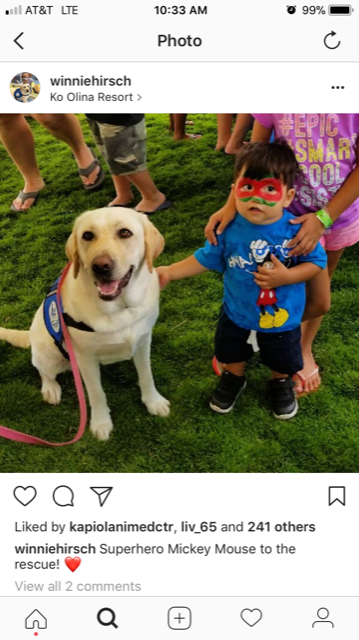 Picture of boy, girl and dog with dialogue. ​Boy: Hi! My name is Liam. Girl: I'm Mele! and this is our Chief Canine Officer. 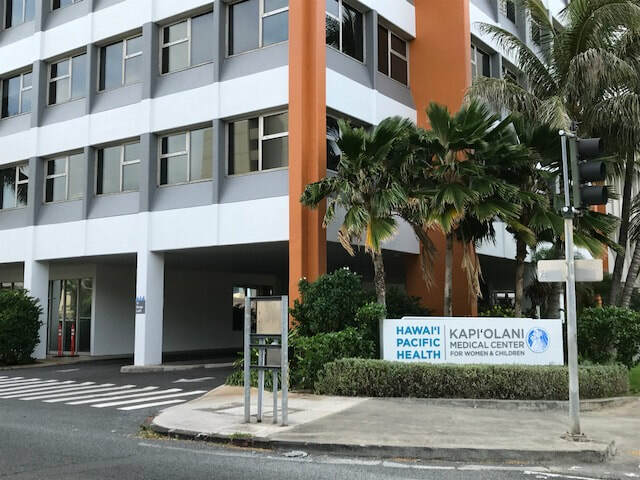 Caption: We heard you’re having a procedure at Kapi‘olani Medical Center. Many children come to our hospital to have procedures just like you. You may have a lot of questions. Follow us and we’ll show you some of the things you might see on the day of your procedure. Picture of a child wearing a backpack and street clothes holding an adult's hand. 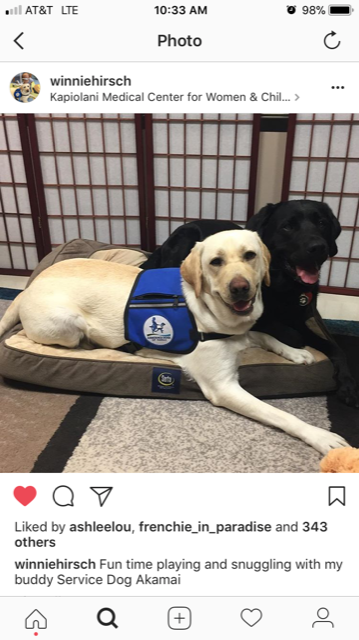 Caption: ​Don’t worry we can bring your caregiver with us! They will be with you as much as possible during your time at the hospital. Who will be coming with you on the day of your procedure? Caption: Do you know when your procedure is? Fill in the calendar and put a star on the day you’ll be coming to the hospital. Use this calendar to count down the days till your procedure. Caption: Which part of your body will your procedure be on? Color the area on the body below. 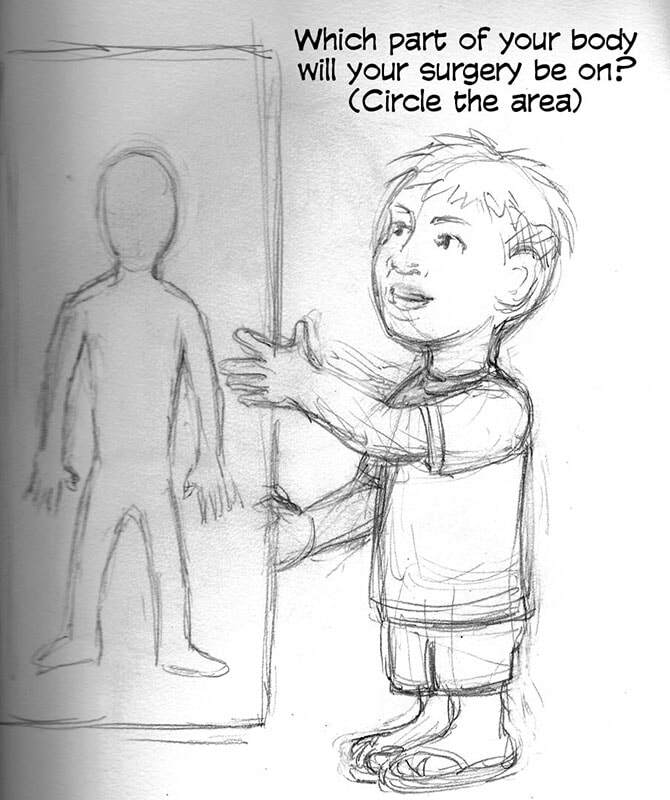 Picture including a body shape where child can indicate where their procedure will be. You can draw both the boy and girl if there is room. 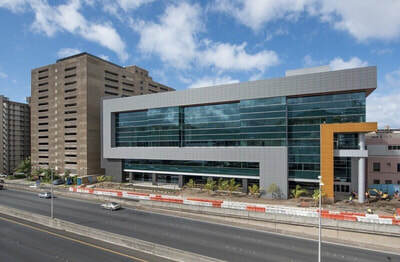 Caption: ​Now that we know when and where your procedure will be, we can show you around the hospital. 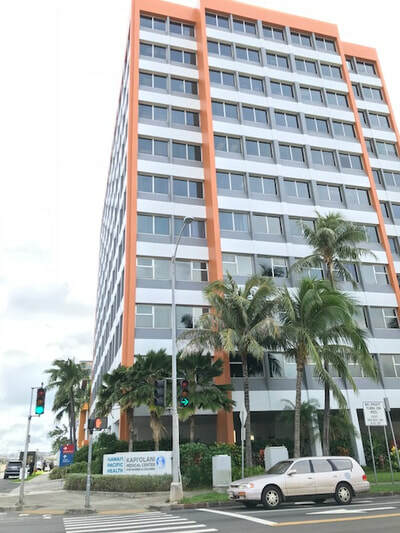 Caption: When you arrive at the hospital, the first place you’ll visit is the Admissions Office. 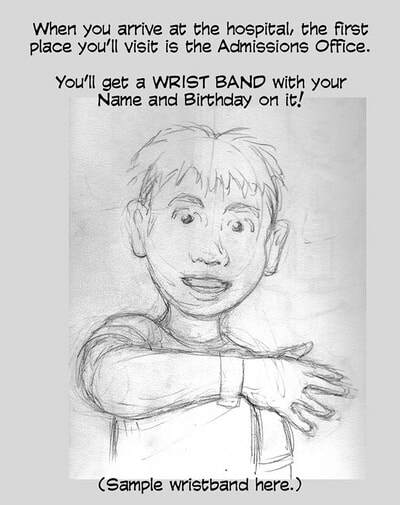 Here, you will get a wristband with your name and birthday on it. All of the doctors and nurses will want to look at it, so get ready to show it off! Picture that includes a closeup of the wristband where there is enough room for the child to fill out their name and birth date. Caption: What color do you think it will be? Color it in with your favorite color. Don’t forget to fill in your name and birthday. Caption: Next, you’ll go to the “get ready room”. 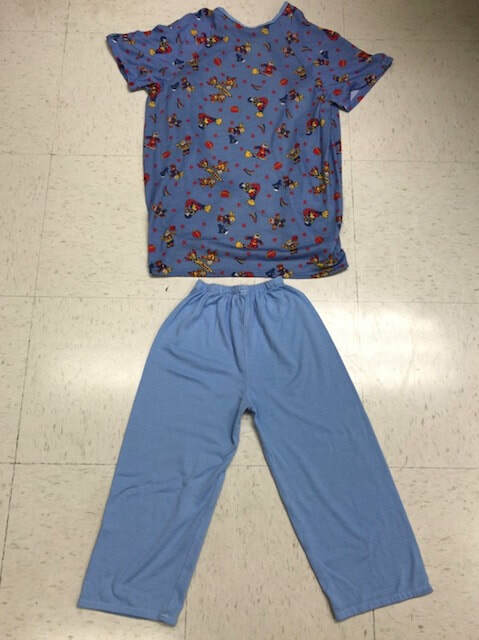 You will put on a soft hospital gown and pants (they look like pajamas). 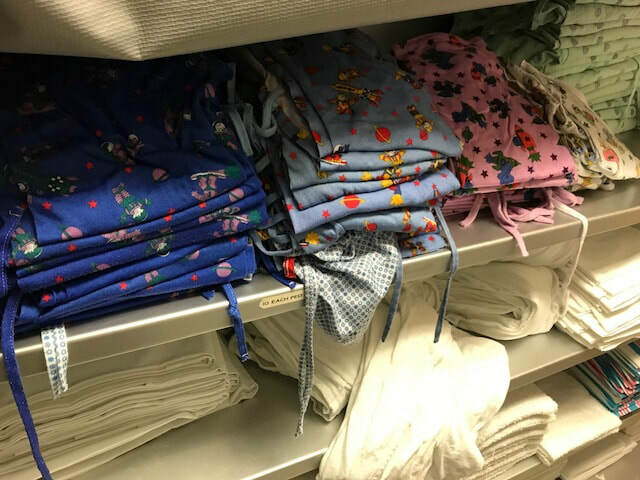 Picture of kids in their hospital outfits. Please make sure they are wearing pants under their gowns. 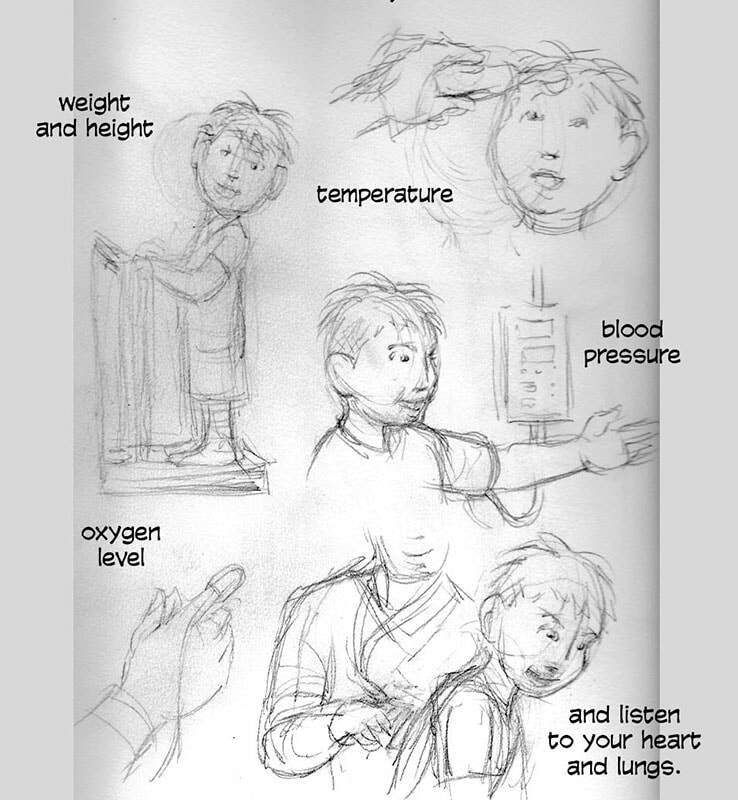 Pictures of the children as the nurse checks their: (1) Height and Weight, (2) Temperature, (3) Oxygen (this machine makes your finger glow red), (4) Blood Pressure, (5) And listens to their heart and lungs. Caption: When it is time for your procedure, your nurse will take you to the operating room and have you lie on a bed. It’s very bright in the operating room. The people in here may look funny since they will be wearing gowns, hats and masks. This is to keep away the germs. Picture of staff wearing gowns, hats and masks, large overhead lights. Include the placement of the stickers and pulse ox on finger of the patient. Caption: ​Doctors will put stickers on your body that are attached to machines watching your heartbeat and breathing. Caption: Your Anesthesiologist (or “sleep doctor”) will help you fall asleep by giving you medicine. You will fall asleep quickly and will not feel anything during your procedure. Picture needs to include overhead lights and a dream cloud for the child to draw in. Caption: Your caregiver will be waiting nearby and will see you after your procedure is over. Caption: ​Once your procedure is done, your doctor will stop giving you medicine and you will wake up slowly in the recovery room. Your nurse will be with you. They will ask how you feel using these faces. I believe this is the actual face chart they use, so it will be on the page with whatever you draw. Caption: You may be able to have an ice pop or drink. There may be some tubes or wires taped to your body. They won’t hurt you, but be sure not to pull them out. 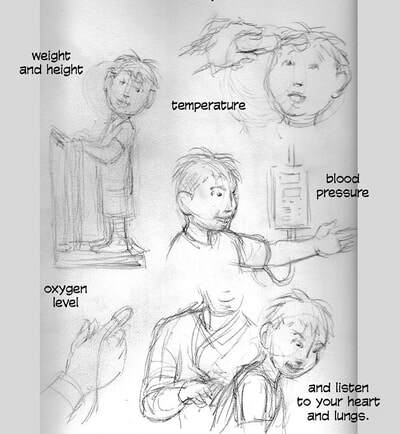 Picture of child needs to include an IV taped to their hand or arm and a pulse ox on their finger. Caption: Some children will go home after their procedure, others may stay in the hospital for a few nights. 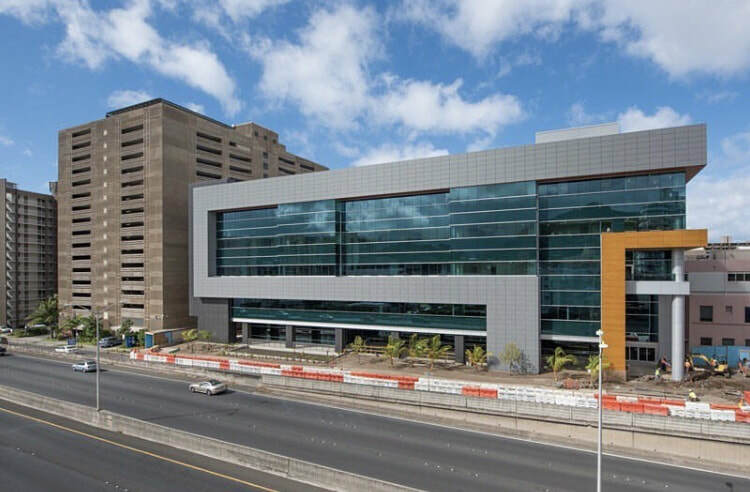 If you are staying overnight at the hospital, what would you like to bring with you? 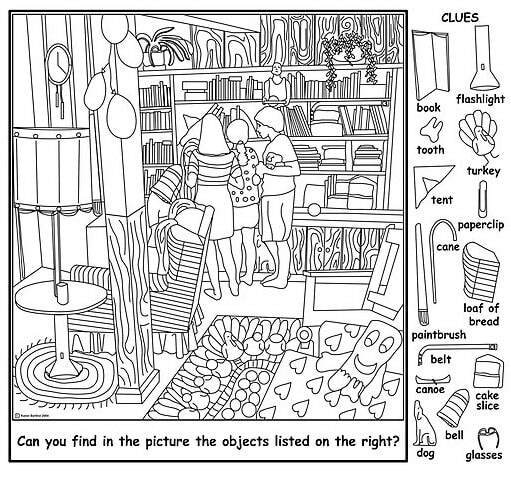 Whatever you draw, leave room for the child to draw items they want to bring with them. 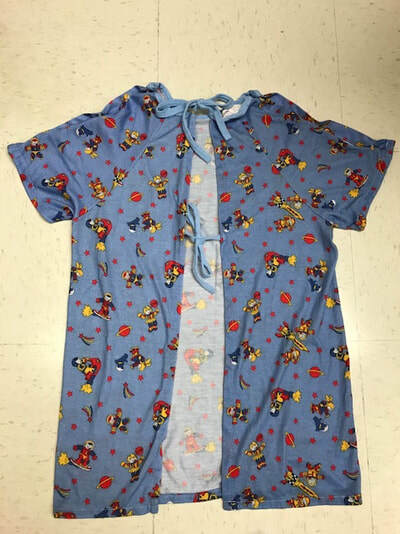 Caption: ​Once the doctor says it is ok for you to go home, a nurse will take out your IV (the small straw taped to your arm) and you can get dressed in your own clothes. The nurse will talk to you and your caregiver about taking care of you at home, and then you’ll be ready to leave! 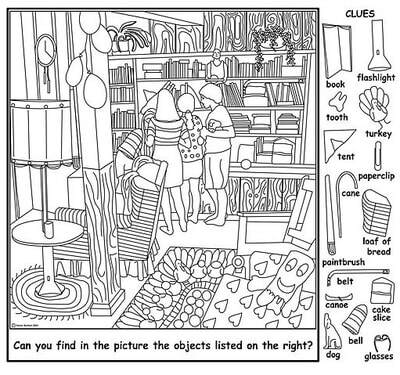 Caption: Can you find the hospital objects hidden in this photo? 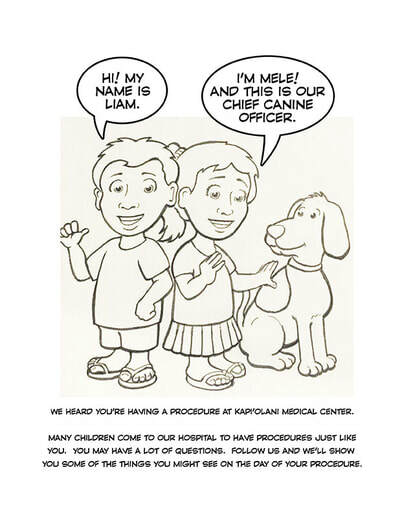 Draw a picture of a room with the following objects: stethoscope, syringe, blood pressure cuff, band-aid, face mask, wristband, paw print, Popsicle. 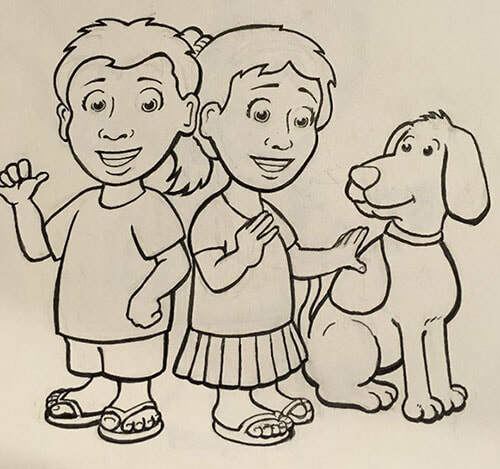 Draw a goodbye picture, perhaps of the dog waving to the children as they leave on the top half of the page. Caption: If you have questions or are feeling worried about your procedure, have your caregiver call a Child Life Specialist at 983-6000.